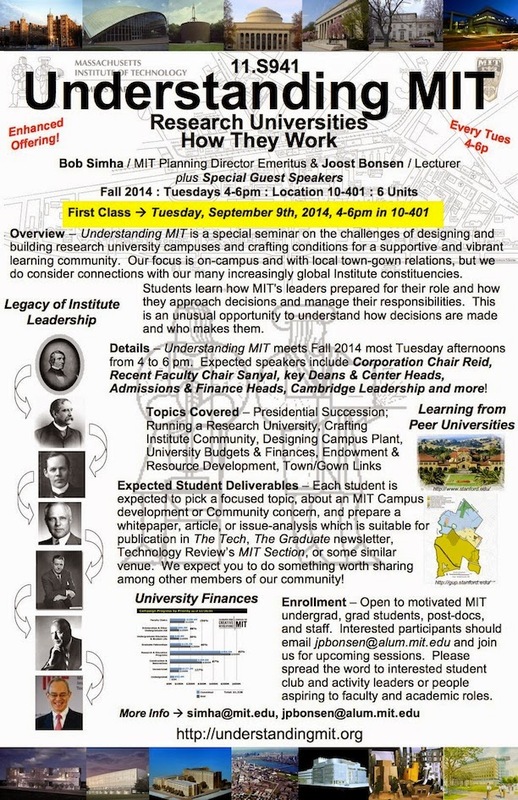 My DUSP Campus Planning colleague Bob Simha and I are hosting our Understanding MIT seminar again this Fall 2014 every Tuesday afternoon 4-6pm starting next week September 9th to survey research universities and how they work, with the Institute as our live-case study. Each week, we invite a different senior academic, administrative, or trustee leader of MIT to share with us what they do to help the Institute stay vital in the short, medium, and long term -- and ask what we can do to be pro-active in improving MIT as well. This is part of my larger action-research agenda on understanding creative places and innovation ecosystems and is sister-class to our MIT Cities Initiative design workshop on Changing Cities.